With revolutionary leader Fidel Castro dead and his brother Raul vowing to step down as president in 15 months, it will soon be the hour of heir apparent Miguel Diaz-Canel, an advocate for modernizing Cuba's state-run media and abysmal internet access. Miguel Diaz-Canel was elevated to the position of first vice-president in 2013, putting him next in line for the presidency. At 56, he is a relative youngster in the ruling Communist Party's leadership and will need to appeal to younger generations if Cuban communism is to thrive beyond the Castro brothers. He has already established press and internet freedom as signature concerns, a potentially disruptive change in a one-party state that has monopolized the media for nearly 58 years. Otherwise, however, he has a much weaker public profile than the Castros and it is not clear what policy changes he would push through. Until now, he has held to the party line or avoided public comment on key issues such as economic and political reforms or relations with the United States, which were overhauled by Raul Castro and U.S. President Barack Obama over the past two years. Still, experts say his position as heir apparent is solid and that he would have to stumble badly for someone else to leapfrog him and become the next president in Cuba's arcane system for choosing its leader. Born after the Castros took power in 1959, Diaz-Canel is a child of their revolution who rose through the Communist Party by cultivating relationships within the political elite while avoiding the show-boating that ended the careers of other pretenders. "He has the advantage of having outlived his predecessors (as heir apparent)," Christopher Sabatini, a Cuba expert at Columbia University's School of International and Public Affairs, said on Monday. Other apparent successors to the Castros have emerged over the years only to fall suddenly. Among them were Carlos Lage, then 57 and one of Cuba's secondary vice-presidents, and Felipe Perez Roque, then 43 and foreign minister. They were both sacked in 2009 as part of a purge by Raul Castro for appearing too ambitious, unwittingly collaborating with Spanish intelligence agents and for speaking ill of older leaders. Diaz-Canel has been careful not to eclipse Raul Castro and is so cautious as to come off as dull and gray, his public statements largely unmemorable. "He's sublimated any ambitions he may have had, so the question is what his role and power will be among the old guard. Most people try to imagine him bridging the new generation and the historic one. That should be challenging," Sabatini said. 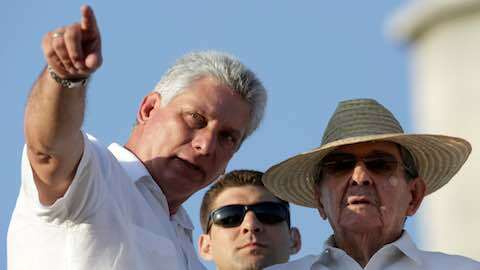 That reserved behavior and the government's secretive nature make Diaz-Canel largely a mystery to all but Cuba's political elite. U.S. officials say they know little about him, and most Cubans outside his hometown of Santa Clara know even less. If he does take over in 2018, Diaz-Canel will be following 59 years of rule by the Castro brothers, one who was gifted with abundant charisma and the other who commanded the absolute respect of top military and political figures. "He will be the first civilian president of the revolution and that will require the confidence of the military," said Arturo Lopez Levy, a former political analyst for the Cuban government whose mother taught Diaz-Canel at university. Raul Castro, who founded Cuba's Revolutionary Armed Forces and served as his brother's defense minister for 49 years, will remain first secretary of the Communist Party for three years after he steps down as president, retaining significant power. "Raul Castro will still be around and he will be a big source of legitimacy," Lopez Levy said. Diaz-Canel's path from young provincial party chief to heir apparent started on a bicycle in the city of Santa Clara, where he was born in his parents' home three blocks from the main square. Two decades ago, his career was taking off as Cuba suffered a severe economic crisis following the fall of the Soviet Union. Average Cubans had no choice but to opt for a bicycle, or walk to work, while political leaders commuted in their Soviet-made Ladas. Diaz-Canel chose to pedal. He would navigate the provincial capital Santa Clara, vying for space on narrow streets clogged with horse-drawn carts, motorcycle taxis and pedestrians. "Everybody was screwed, and the people saw the first secretary on a bicycle. He didn't do it to look for popularity. He did it because that's how he was. He was very straight-forward," said Jose Antonio Fulgueiras, 62, president of the journalists' union in Villa Clara province who covered Diaz-Canel's rise as a politician and considers him a friend. Beyond its populist touch, the bicycle gave Diaz-Canel greater stealth as he approached state enterprises for surprise inspections. The fight against corruption became his trademark, and he would ride that bike, figuratively, to the upper reaches of power. After nine years as leader in Villa Clara, Diaz-Canel took the same job, as first secretary, in Holguin province in 2003. He was also promoted to the 14-member Politburo, the highest leadership of the Communist Party. In Holguin, he lacked the hometown advantage but did well enough to be summoned to Havana in 2009 to serve as minister for higher education. Then on February 24, 2013, the National Assembly promoted him to first vice-president, a significant generational shift. Diaz-Canel was the first Cuban born after the 1959 revolution to ascend to the No. 2 job. 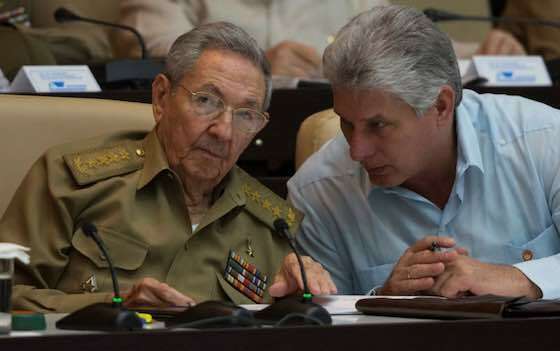 Despite his attempt to remain unexciting, Diaz-Canel has had his provocative moments, especially with regard to Cuba's strict control of the official media. He has often called for a more dynamic and open media, and has welcomed the internet, still available to only a small minority of Cuba, as a tool to help the people rather than a threat to the government. Only 5.6 percent of Cuban homes had access to the internet in 2015, according to a 2016 U.N. report. Full-fledged internet access would dilute the disciplined message reported by official media, but Diaz-Canel says trying to stop the internet's spread is a losing proposition. "Prohibiting it would be an almost impossible delusion that doesn't make sense," he told reporters shortly after becoming first vice-president. The government would later extend Wi-Fi signals to public places across the country. It is unknown whether or how much Diaz-Canel was responsible for that measure. To compete with the public's demand for social media, he says Cuba's state-run media needs to change, calling for an end to secrecy, urging more "polemical" coverage of news and telling the Communist Party it should allow more constructive criticism. Latin America: "Big Changes Ahead for Cuba"